MadAppLauncher is a simple application launcher. 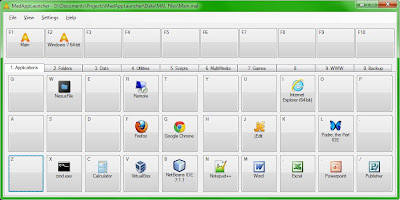 Launch files in two to three keystrokes; just activate the application launcher, press one number key to select a tab(group) and another key(letter/symbol) to launch the corresponding application. Group applications, folders, scripts, etc. with ease. It supports drag and drop and manual editing. Requires Microsoft .NET Framework 4.0 Client Profile (web-installer included).